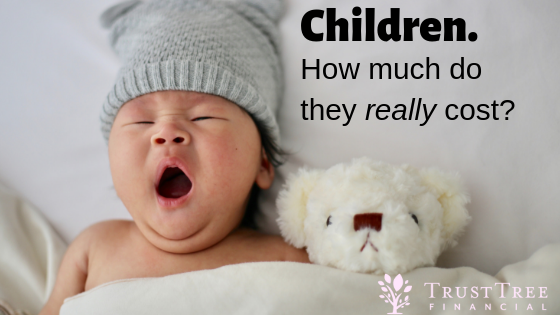 ﻿How Much Does Having A Child Really Cost? It is always exciting to know that we are going to be bringing a new member into the family. The joy and excitement that come with the knowledge of a new pregnancy never fail to get us jumping off their couch to start choosing the paint colors for the new-born’s nursery. I should know, I just did it twice in the past three years! But looking beyond the adrenaline rush, have we ever wondered how much it will cost us to raise a child from birth to grown-up? Are most people prepared for the financial impact, or have at least an idea of what it will cost to have and raise a child? A recently relevant study, from a U.S. Department of Agriculture (USDA) report from 2015, says that the average cost of raising a child from birth to age 17 is $233,610 for middle-income family with two children. The study assumes a married couple (versus single parenting) and does NOT factor in a university education. So, there’s one estimate – nearly a quarter million dollars – or roughly $13k a year. This report breaks up costs into three income ranges, with $233,610 being the average for those qualifying families who make between $59,200-$107,400. Those in the lower income range, making under $59,200, required an average of $174,690 to raise a child. Those in the highest income range, making over $107,400, spent $372,210 on raising a child. In other words, the higher the family income, the more is typically spent on the child on average. Digging deeper into specifics, a study by Business Insider says the average cost to have a baby in the US, without complications during delivery, is $10,808 — which can quickly increase to $30k when factoring in care provided before and after pregnancy. Some of the factors accounting for the increase are dependent upon the type of insurance you have, any complications that may come about, and all the necessities (crib, car seat, diapers, etc). If you were unlucky enough to have problems getting pregnant in the first place, you would have to include things such as In Vitro Fertilization (IVF) at approximately $15k per attempt. How about spending $40-60k to get an egg donor? Or $100k to get a surrogate mother? These procedures are not factored in to the “average cost of birth” but nonetheless, cannot be ruled out. For those interested in using an online calculator for a more accurate projection, consider using this online one from Babycenter. Soon enough comes a time to make a financial decision for childcare. There are many childcare options available depending on the circumstances of the family, and will vary depending if both spouses work versus just one. Whether it’s daycare, schooling, or a nanny, you will see how it can easily add up to a grand per month. At $1,000 for a period of 5 years, this adds up to $60k without taking account of toys, books, medical and any other expenses we would spending during their toddler years. Of course you can have a parent stay at home with the child, and there are many advantages to this. The major downside is not having that second income stream contribution. So, there’s that. As children get older and into different age ranges, the costs steadily increase. Chalk it up to activities, education expenses, transportation, electronics, and trips (Hello Magic Kingdom!). Plus kids eat more as they get older, so food really “eats” into the budget more than before. So, even if the average yearly cost is $12k early on, it could trend higher and closer to $14k by age 17. That steady increase holds firm amongst all demographics and income ranges. In other words, those in a higher income range (above $107,400 a year) may spend $19k a year in the infant years, and average spending over $23k as teens. And these numbers will continue to rise due to inflation, if nothing else. Will you need to add an extra bedroom in your house to accommodate your little one(s)? Probably. More is at stake while your kids are young; will you need to increase your life insurance protection for your family? This is a rhetorical question…YES! What types of schools will they be attending ages 5-17, public or private? Huge discrepancy in cost. What age will your child be out of the house? I wouldn’t assume that by age 17 they will be self-sufficient. You may want to prepare on supporting, on some level, until age 25. College. Most parents will make an effort to put money aside for college, which averages $26k for annual out-of-state tuition now (and maybe double that in 18 years from now!). Up until now, we’ve talked about averages based on a recent study. Let’s talk reality for a sec. Assuming you won’t want your child to sleep in your bed, you will want more insurance, you want them to go to decent schools, you won’t kick them out at age 17, and you would like to help save for them to go to college – I’d say be prepared to spend closer to $1mil when it’s all said and done. So not just the $1-2k per month for 17 years, rather $3k or more for 25 years. Think I am crazy? I am not the only one saying this. If you don’t believe me, check out this clip. In summary, while the financial burden of supporting a child from birth to adulthood may seem daunting to most of us as parents, the joy of having an additional family member remains as something we can look forward to as a family. With proper financial planning, we can ensure our finances can support our families for the long run. Just be prepared – not only is parenting challenging, it’s not cheap!